With a title like “The Jewish Cardinal,” a poster showing a befuddled Adam Sandler in the lead role, clutching a bagel in one hand and a crucifix in the other, wouldn’t have been a stretch. But that would be a much different movie. This French film, set in Paris, directed by Ilan Duran Cohen and starring Laurent Lucas as Jean-Marie Lustiger, tells the actual story – with some cinematic license, of course – of a son of Polish-Jewish immigrants who converted to Catholicism in 1940, became a priest and had a meteoric rise through the Vatican in the early 1980s. Lustiger’s ascent led to being named Archbishop of Paris and a close adviser to Pope John Paul II. Lustiger, whose nickname was “The Bulldozer,” insisted he was both Catholic and Jewish, and the need to reconcile that belief to himself and others is at the core of the film. His dual beliefs provoked skepticism among some fellow Catholics, and scorn and contempt from Jews who rejected he could be both. Among them is Lustiger’s ashamed father (Henri Guybet), who recalls how he was bar mitzvahed at about the age of his son’s conversion to Catholicism, and considers his son’s rise through the Vatican to be a “traitor’s reward.” Heightening his feelings is the remembrance of his wife perishing in Auschwitz. Lucas portrays Lustiger as high-minded, serious and hypersensitive, and at times, conflicted by his dual religious identities. His struggle over this is put to the test in several ways. Lustiger goes on an emotional visit to Auschwitz, and his faith is found wanting. He displays cowardice upon the death of his father in the film’s most gripping scene, which causes estrangement from a cousin (Audrey Dana, in a compelling role), the family member he’s closest to. And later, Lustiger must decide whether to intervene over the inflammatory actions of a convent established by Carmelite nuns in Auschwitz in the 1980s. 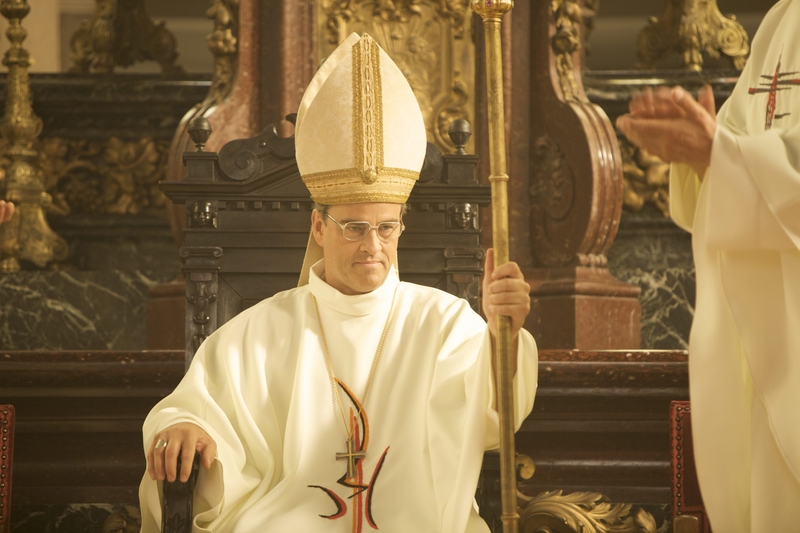 Lustiger’s close relationship with the Polish pope (Aurelien Recoing), portrayed as alternately whimsical and stern, and politically savvy, is also a challenge to his beliefs. That particularly becomes the case over how the two view Poland’s remembrance of the Holocaust, stirred by the controversial convent. It’s hard to know how much historical liberties were taken by Cohen, who co-wrote the screenplay. But Lustiger, who died in 2007, remains an anomaly to the end – an enigma to many, including, at times, to himself. Rating: Not rated, but PG equivalent. The Lowdown: A Jew who converts to Catholicism becomes a priest and later an adviser to Pope John Paul II, while attempting to reconcile his dual religious identity.